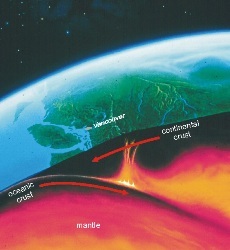 UPDATE: Cascadia Subduction Zone Scenarios (VIDEO). 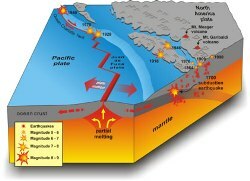 Since the mid-1980s, there has been accumulating geologic evidence of large local tsunamis generated by earthquakes along the Cascadia subduction zone off the Pacific Northwest. Information from recent geophysical and geological investigations constrains the potential rupture-zone geometry and average repeat time of inter-plate thrust earthquakes. Based on this information, tsunami hazard maps have been prepared for coastal communities in the Pacific Northwest using sophisticated numerical models to simulate tsunami propagation and inundation. In this study, sources of uncertainty in tsunami hazard calculations are described and a probabilistic hazard analysis for tsunamis, similar to probabilistic seismic hazard analysis (PSHA), is outlined. Though probabilistic tsunami hazard analysis (PTHA) shares many similarities with PSHA, there are specific issues unique to tsunami hazards that need to be accounted for in the probability calculations. 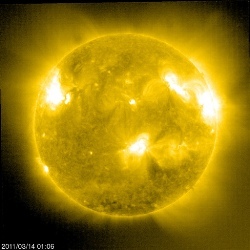 An M-class flare sets off from sunspot region 1166. 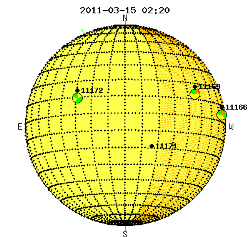 Region 1169 also looks prone for M-class activity. Six sunspot regions are coming along the farside of the Sun and should begin to rotate around the western limb in the in the next 72 hours. Watch for continued extreme weather which includes earthquake and volcanic activity. This entry was posted in 2012, ancient text, ancient_text, asteroids, astrology, astronomy, comets, cycle 24, earth change, earth changes, earth’s core, earthchange, earthchanges, earthchangesmedia, earthquake, earthquakes, earth_changes, extreme weather, flood, floods, galactic center, galaxy, global warming, hopi prophecy, hopi_prophecy, hurricanes, lunar-eclipse, lunar_eclipse, mayan, mayan prophecy, mayan_prophecy, mitch battros, mitch_battros, motorcycle, pole shift, science, solar eclipse, solar storm, solar_eclipse, solar_flares, solar_system, space, space weather, sun-earth, sun-earth-connection, sunspots, sun_earth_connection, tsunami, Uncategorized, universe, volcanoes, weather and tagged 2012, ancient text, ancient wisdom, charged particles, coronal mass ejection, cycle 24, earth changes, earthchangesmedia, earthquakes, extreme weather, hopi prophecy, mayan prophecy, mitch battros, pole shift, solar cycle, solar cycle 24, solarstorms, space, space weather, sunspot count, sunspots, tsunami, volcanoes. Bookmark the permalink.